NASA and the crew behind its New Horizons spacecraft declared few days ago that Pluto —the dwarf planet — has a huge tail. It's not a physical tail like a dog's, obviously, but rather a cold cloud of ionized gases trailing a projected 48,000 to 68,000 miles behind Pluto, according to a NASA press release. This giant tail is essentially part of Pluto's atmosphere. Except that the particles of atmosphere are being stripped away by solar wind, a flood of electrically charged particles that continually pours out of the sun in all directions. Randy Gladstone, a New Horizons co-investigator at Southwest Research Institute in San Antonio, said in a NASA press conference on Friday. "We see the atmosphere way far out. We see it from the ground out to 1,000 miles above the surface. Because Pluto is such a tiny planet — it's a fraction of a percent as massive as the Earth — its atmosphere escapes directly into space, Gladstone said. 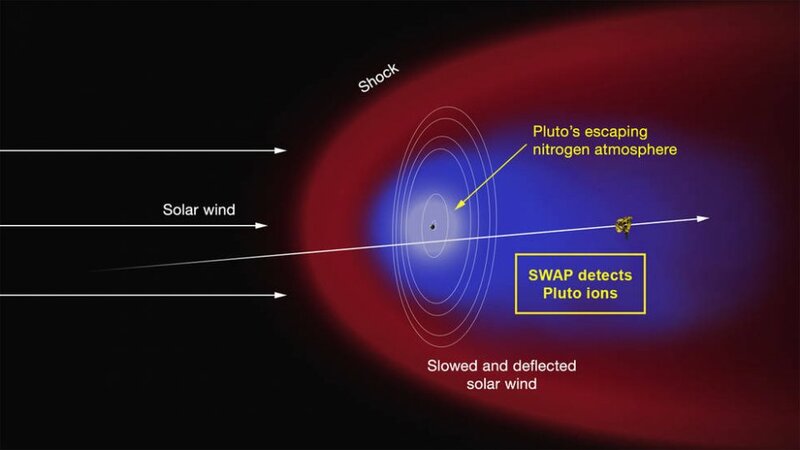 Artist’s illustration of the interaction of the solar wind with Pluto’s predominantly nitrogen atmosphere. Gladstone and others discovered the tail after observing data from the Solar Wind Around Pluto (SWAP) instrument on the New Horizons spacecraft. The device found an irregularity in the solar wind around the dwarf planet: A depression composed of nitrogen ions. This depression is the tail, and it ranges to an unknown length behind the planet. Fran Bagenal, a New Horizons co-investigator from the University of Colorado at Boulder, said in the press conference "We have actually flown through this [tail]," Ionized gas forms when a cluster of energy thrashes atmospheric atoms and molecules. This bombardment pops electrons off the atmospheric gas particles, letting their electrons to easily circulate. The end result is plasma. As far as we know, plasma is the most ordinary state of matter in the cosmos. There's basically a lot of energy pouring out of stars, and a lot of gas in space to create plasma. Even though it might appear surprising, plasma tails like Pluto's aren't new. They even occur behind other planets in the solar system, like Venus and Mars. The group still hasn't determined the exact shape of Pluto's recently discovered tail. They also don't know precisely how it was formed. So NASA is eagerly waiting for New Horizons to send back more data. By August the crew hopes to compute how fast Pluto is losing its atmosphere to space — and, also, how rapidly the icy world is shrinking.